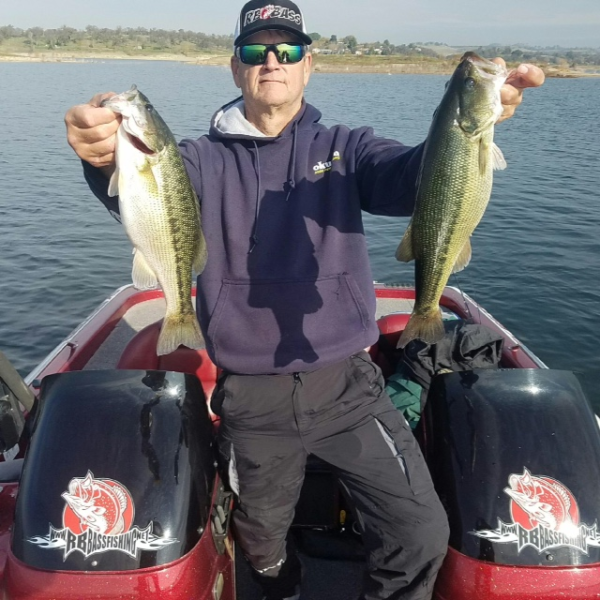 Lake Camanche is fishing good for Quality Bass right now. You can catch bass several different ways. Ron Howe and Charlie King had a great day on the water, The lake is about 50 ft higher than last year at the same time, so it was Like a new lake to us. We started off close to the ramp on the River Channel bend near the North Fork ramp, despite all the recent news about the lake there was only 4-6 boats at the North Ramp. There is a solid Alabama Rig Bite right now all over the lake, this bite was good till about 1130 when it got cooler and breezy the Rig bite slowed down. Fish were holding in the 10-15ft range on drop offs. 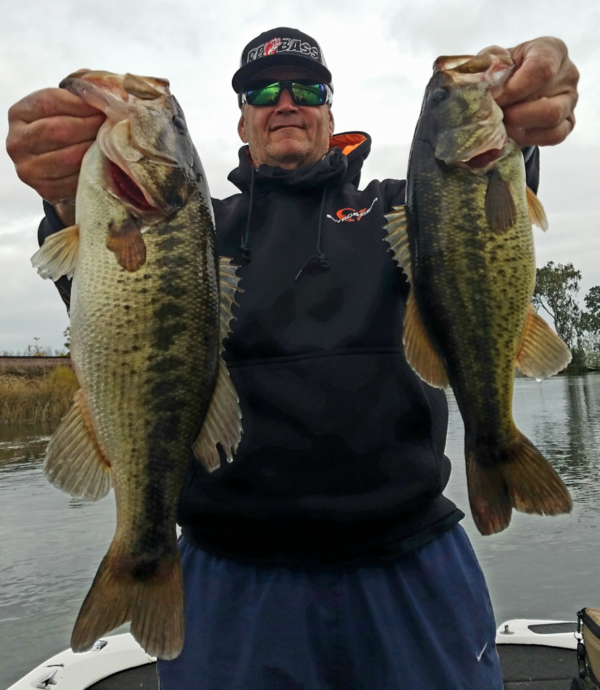 We caught a mixed bag of Spotted Bass and Largemouth Bass. We also caught fish on 1/2 oz Jigs and Tubes as well as Small swimbaits in 15-20ft of water on the main body near Offshore flats and Island Tops. The fish were knocking slack in the line! We could get 2-3 Bites in a Spot and then it would shut down so we would continue to bounce around making our way up river for the afternoon. 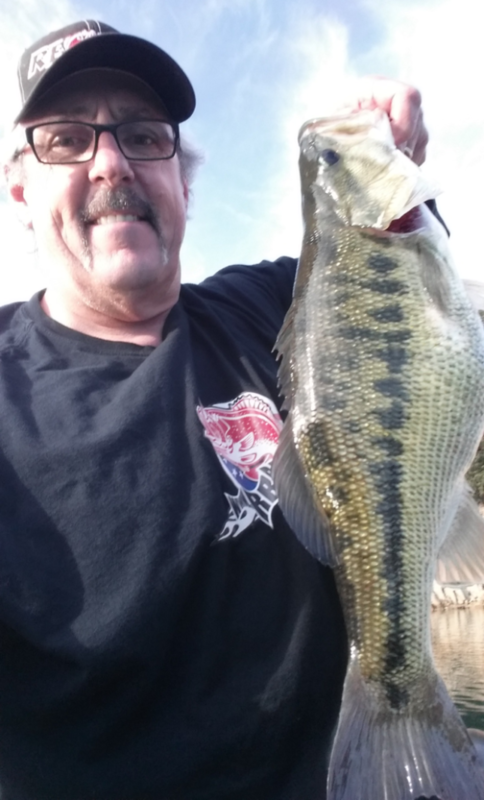 The Main Body was dominated with Spotted Bass, so we moved up river to try new water. As the wind picked up we had to make changes to get bites, it was surprising that with increasing clouds and a breeze that the reaction bite slowed down, so We made adjustments and changed to a Darthead in 1/16 oz with a 7″ Morning Dawn worm. You had to shake the bait just right to trigger bites. Unlike the Main Body Bait chasers the fish up river were chewing Craws, you could see the Red raw color in there jaws. We would throw our baits close to chunk rocks with steep walls, shake the worm and then it was on! The fish were moving deeper twords the end of the day in the 25-30ft range. And these fish were dominate Largemouth.